Marco Estrada faded a bit before finishing another strong showing against the Texas Rangers. The Toronto Blue Jays gave their right-hander plenty of wiggle room. Russell Martin homered and hit a pair of RBI singles to back six solid innings from Estrada, and the Blue Jays beat the Rangers 8-5 on Friday night. Martin's drive to left field for an 8-0 lead in the sixth came right after Yangervis Solarte connected on a solo shot . It was the second homer of the season for both in a game delayed 36 minutes at the start by rain. Estrada (1-0) took a two-hit shutout into the sixth before Shin-Soo Choo homered for the third straight game. After two singles and a walk with two outs, Estrada got Robinson Chirinos on a flyout on his 105th and final pitch. "It just was kind of getting away from me late in the last inning, but I felt good overall," Estrada said. "My legs still felt like they were under me. I wish I would have had a quicker inning, maybe give the guys another inning." Twice a dominant winner in Arlington when Toronto beat Texas in back-to-back AL Division Series in 2015-16, Estrada allowed five hits and a run with a walk and seven strikeouts. "He had everything working," manager John Gibbons said. "I've seen that so many times, but he was in complete control. They put a little pressure on him there, and he got the big out with the bases loaded." 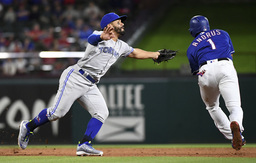 After the Toronto bullpen gave up four runs in the seventh, closer Roberto Osuna allowed two singles but got Choo to ground into a double play in a scoreless ninth for his third save. Matt Moore (0-2) had his second straight rough start for the Rangers after leading the NL with 15 losses last season in San Francisco. The left-hander allowed five hits, four walks and six runs - five earned - in 3 1/3 innings. Moore, who didn't have a walk in his first Texas start, also hit Martin with a pitch. "I felt like I had better control today, which is weird I know, just with my off-speed stuff in general," Moore said. "The walks, those are going to wind up being the Achilles heel." Josh Donaldson drove in a run among two singles and scored twice, and Solarte walked his first three times up. A day after becoming the Latin American leader in hits, Adrian Beltre had three more to break a tie with Rickey Henderson for 24th on the career list and is now at 3,058. He and Choo each doubled in a run in the seventh. Elvis Andrus added an RBI single, his third hit. The Texas-Toronto rivalry had already cooled a bit with both teams missing the playoffs last year. And now Jose Bautista, who remains unsigned, is gone a little less than two years after a brawl that had its roots in his epic bat flip after the go-ahead homer in the 2015 playoffs. The Rangers hit Bautista with a pitch in the last regular-season game between the teams in Arlington in 2016, the year after the bat flip. When he slid hard into second base on a force play, Rougned Odor punched him to start a wild bench-clearing melee. "He wasn't well-liked here, no doubt about that," Gibbons said. "I know Jose will miss (the boos). I'm sure he'd rather be there and getting them. He's always viewed as the bad guy anyway. I do think he liked that, or didn't mind it anyway." The Rangers traded C Brett Nicholas to San Diego for a player to be named or cash. Nicholas, who had been at extended spring training with the Rangers, was assigned to the Padres' Triple-A affiliate in El Paso. Blue Jays: RHP Marcus Stroman (0-0, 7.20 ERA) gave up seven runs in four innings in his first regular-season appearance at the home of the Rangers last season, an 11-4 loss. He also lost Game 2 of the AL Division Series in Arlington in 2015. Rangers: LHP Mike Minor (0-1, 3.86) gave up three hits and two runs in 4 2/3 innings in his Texas debut and first major league start since 2014, an 8-2 loss to Houston. He was a starter in Atlanta before shoulder surgery sidelined him for two years. Minor returned as a reliever in Kansas City last season.